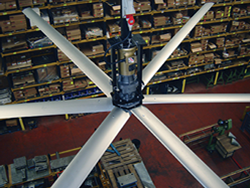 Timbers Kovar in Cleveland is the distributor for Serco industrial fans. Serco’s High Volume Low Speed (HVLS) fan series is designed to provide facilities with an energy-efficient and cost-effective cooling and heating solution. High Volume Low Speed fans move large volumes of air at low speeds over very large areas. The fan blades produce a massive column of air that flows down to the floor and outward in all directions, creating a deep horizontal floor jet that ultimately circulates air up vertically and gets drawn back through the top of the fan. The result is more consistent temperature control, improved airflow / circulation and improved energy efficiency. In cooler months, the HVLS fan operates in reverse, circulating hot air trapped at ceiling level and creating a warmer and consistent mix of air throughout the facility (referred to as “destratification”). The Serco ATEC’s airfoil style blade design produces a massive, cylindrical column of air that flows down to the floor and outward in all directions, creating a horizontal floor jet that consistently circulates air in large spaces. This “horizontal floor jet” pushes air a greater distance before it is pulled back vertically toward the blades. The greater the down flow, the greater the air circulation and resulting benefits. In the colder months, fans can be run in reverse to circulate the hot air trapped at ceiling level known as “destratification”. The information you provide here will be kept strictly confidential. We will NOT sell or distribute your e-mail address. Fields marked with * are mandatory fields.